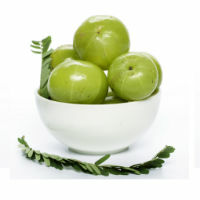 Gooseberry s a low calorie fruit. It contains mostly water which constitutes 80% of it. It is a rich source of carbohydrates and dietary fibre. It is one of the major providers of Vitamin-C and contains minerals like calcium, phosphorous and iron. It is also a rich source of antioxidants. It helps in maintaining proper health of hair and makes them thick and soft.